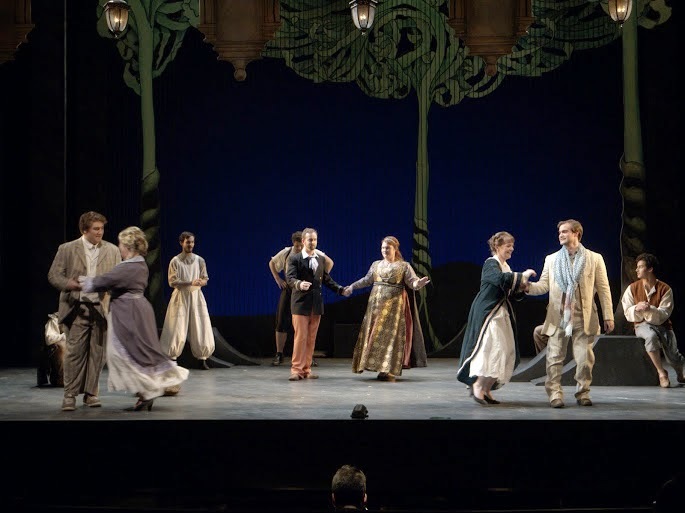 Portland State University's award-winning opera program continued its string of successes with Benjamin Britten's A Midsummer Night's Dream at the Lincoln Performance Hall on Sunday, April 27. Directed by David Edwards and produced by the PSU Opera Department under Douglas Schneider and Christine Meadows, with the orchestra conducted by Ken Selden, the project was a musically ambitious undertaking, and this production showcased the high level of talent that is possible in a student opera. The opening fairy chorus wanted for more dynamic contrasts to offset the monochromatic melodic lines, but the blocking was fine...slowly acrobatic and appropriately hypnotic. Their later choruses were more nuanced. When Tytania (Hannah Consenz) took the stage, her presence and vocal ability were immediately obvious. When she sang 'Come, now a roundel' later in the performance, it was haunting, and mysterious--completely engaging. The vocal requirements for the role of Oberon presented an extreme challenge, and it was nice to hear that Loren Masanque was up to the task. The agility necessary for the rapid and difficult switching between loft and modal voices was certainly within Masanque's capability; to hear him do this while maintaining crisp and near-perfect diction was a real pleasure. When the merry group of players took the stage, they were shepherded by local favorite Andre Flynn as Quince. 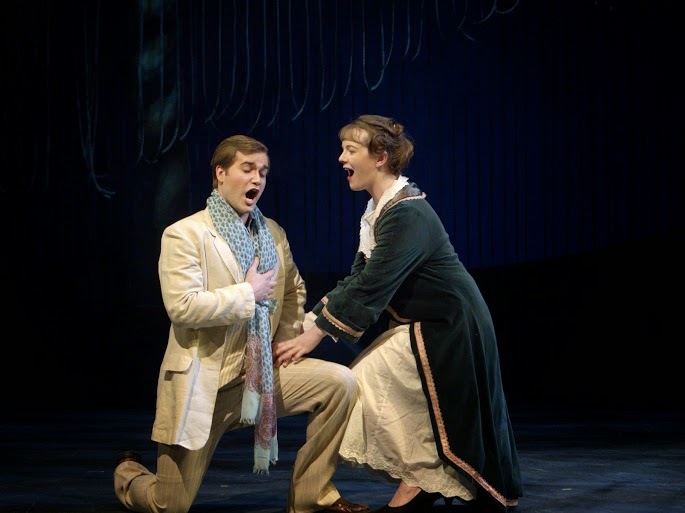 His fine, robust baritone and comedic timing were crucial to the success of this element. While Nickolas Hoback's Puck was appropriately...well, puckish...and acrobatic as well as charming, none stole the show so much as Bottom, played by Benjamin Espana. Many things contributed to his success: a ceaseless roguish smile and unflappable air were but the starting point. He showed a flair for difficult physical comedy, as well as nuanced timing, and a wonderful voice with great potential. Many of the laugh-out-loud funny moments were thanks to Espana and those interacting with him. Another performance of note came from Maria Piro as Helena. She displayed perhaps the most polished and mature singing technique of the afternoon, and certainly did not sound like someone singing only her first lead role in an opera. Not only was her voice marvelous but her acting chops were sound as well; convincing and engaging. All in all this was a wonderful production; Benjamin Britten is definitely not beginner's music, and both singers and instrumentalists were up for it and performed admirably. This is a good work to allow many performers a shot at the spotlight, and there were far more wonderful performances than are mentioned here, and a number of the roles are sung by alternate cast members in other performances. Once again, PSU has shown its ability to put on a big-time show, and to do it very well indeed. There are two more performances; this Friday and Saturday, May 2nd and 3rd at 7pm. Tickets are available online or through the box office. 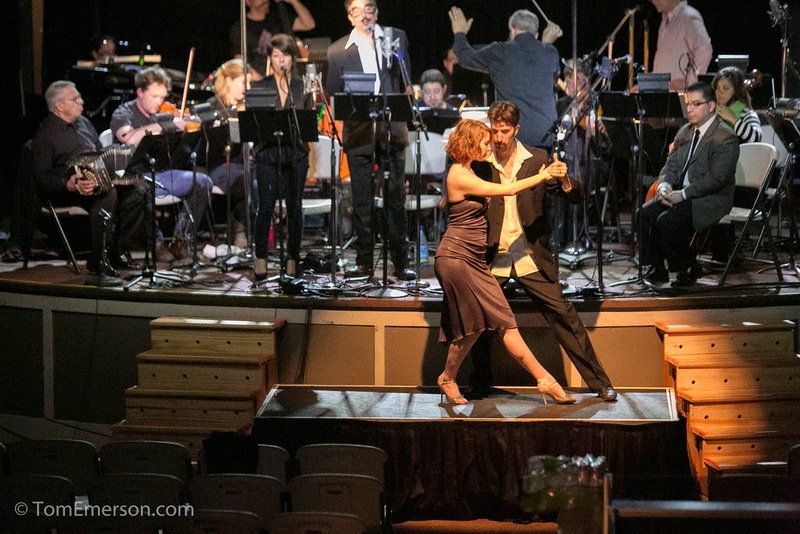 Inspired singing and narration, elegant dancing, and tight ensemble work by Third Angle New Music Ensemble made the performance of “Maria de Buenos Aires” a memorable one on Friday, April 26th at the Wonder Ballroom. A standing-room-only audience packed the house for Astor Piazzola’s unique tango opera, which was delivered in concert format with instruments and voices electronically amplified. Because the narration and the singing were done in Lunfardo, an obscure Spanish dialect of Buenos Aires and Montevideo, a translation of the text was projected onto a screen to the left of the stage. That worked fairly well, but sightlines with which to view the evocative dancing were compromised by the seating, which led to some listeners to just close their eyes and enjoy the sound. The libretto, written by Uruguayan poet Horacio Ferrer, contains highly charged imagery that is challenging to make sense of. Consider “It will be as old as God and two bruises,” “Here comes the girl, riding her cat like wet nuns of dusk,” and “That your eyes will hold a flat-nosed yard.” Almost every line of text was stuffed with intoxicated verbiage, including an usual word now and then like “archtainted.” I have to admit that without the aid of program notes and other sources, I would not have understood the highly surreal story line at all. It goes loosely like this: The ill-fated Maria was boor in a poverty-stricken suburb of Buenos Aires “one day when God was drunk.” She grows up very fast (seven days) and soon is attracted to downtown Buenos Aires where she is seduced by tango music and becomes a streetwalker. She dies young. A demon spirit called El Duende or The Goblin summons her spirit so that she can live a second time, but Marie is buried again, leaving her shadow to wander about Buenos Aires. This is followed by circus of psychoanalysts and then by Maria recovering her virginity and giving birth to a baby that might actually be herself. In a way, it didn’t matter what the text was, because the singing of Michelle Fernandez in the title role and Pepe Raphael as Payador plus the narration of Enrique Andrade was superb. While Fernandez’s lower register was especially seductive, she also commanded the high notes fearlessly, and brought down the house with her rendition of “Yo Soy Maria” (“I am Maria”). Not to be outdone, Raphael gave an impassioned performance, using everything from tremolo, heightened whisper-like singing, and a driving tone to thrilling effect. Andrade also used an incredible vocal palette to texture his delivery, and the result was totally convincing. The Third Angle ensemble, conducted by Jeff Peyton, played the music with intensity and verve. The sound was well-balanced and never over-powered the singers. Argentinean Coco Trivisonno delivered the goods on the bandoneon. 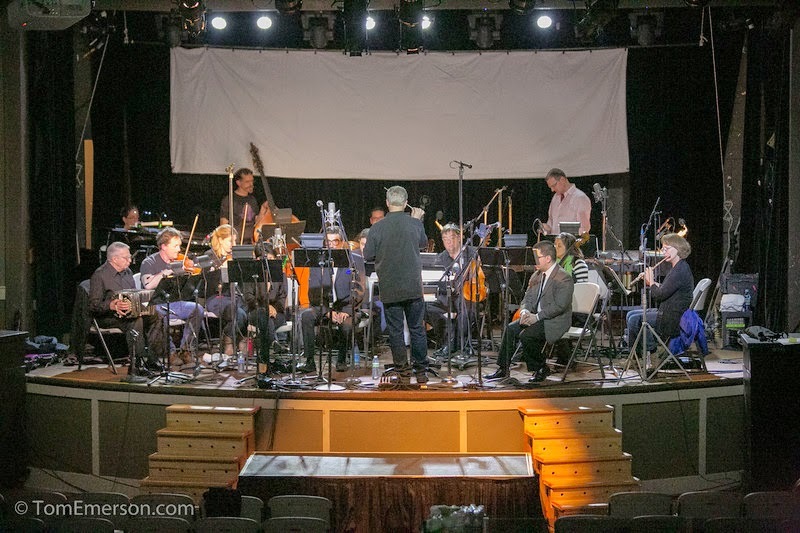 Other members of the ensemble were violinists Ron Blessinger and Emily Cole, violist Charles Noble, cellist Marilyn de Oliviera, bassist Jason Schooler, guitarist John Mery, flutist Georgeanne Ries , pianist Susan Smith, and percussionists Jonathan Greeney and Sergio Carreno. It would be terrific to experience this piece again sometime in the near future. 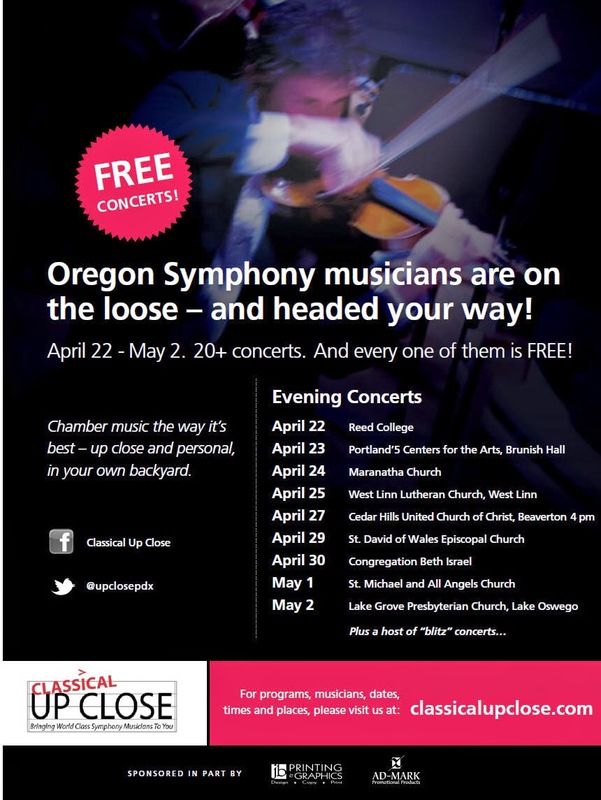 It's that time of year when musicians from the Oregon Symphony go crazy and give free concerts all over the Portland metro area. So be sure to check the Classical Up Close web site for the latest info. Congratulations are in order for Keith Buncke, who is a junior at the Curtis Institute of Music. 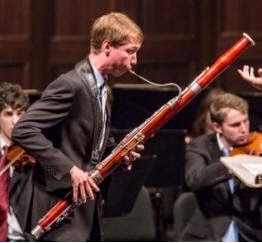 Buncke beat out 90 other bassoonists for the principal bassoonist position with the Atlanta Symphony. Buncke grew up in Lake Oswego and played with the Metropolitan Youth Symphony, the Portland Youth Philharmonic, and the Portland Columbia Symphony Orchestra. Here are links to two articles that report his most recent success: the first is from the Interlochen Academy, and the second is from The Kentucky Center for the Performing Arts where Buncke recently completed an artist residency. I skimmed through the Atlanta Symphony news releases and found that this tidbit:Michael Gandolfi’s new work, Sinfonia Concertante, will be premiered April 30 and May 2, 2015, and has been commissioned to honor Robert Spano’s parents. The work will feature four ASO musicians: Principal Oboe Elizabeth Koch Tiscione, Principal Bassoon Designate Keith Buncke, Principal Clarinet Laura Ardan, and Principal Horn Brice Andrus. It was recently announced that Kenji Bunch will take over as the artistic director of Fear No Music, one of Portland foremost new music ensembles, at the end of this season. Stepping down from that leadership position is Paloma Griffin Hébert, who will continue to play violin with the ensemble. In the meantime, Fear No Music will present a concert of Bunch’s chamber music at the Alberta Rose Theater this Friday, April 18th, at 8 pm. 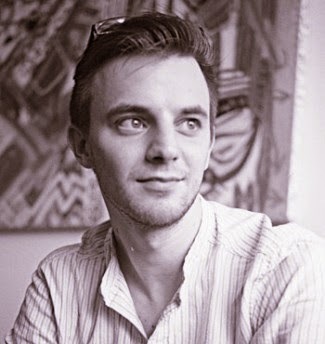 Bunch grew up in Portland, played in the Portland Youth Philharmonic and graduated from Wilson High School before transitioning to New York City where he attended and graduated from Julliard (BA in viola performance and MA in viola a composition), married pianist Monica Ohuchi (a fellow Julliard grad who will become the executive director of Fear No Music next season). I recently talked with Bunch about his work. Here’s our conversation. You are a busy fellow. You teach with the Portland Youth Philharmonic, play in the viola section of the Oregon Symphony, and play with other ensembles like the Free Marz String Trio. You’ve got this new appointment and a big concert coming up. Bunch: I also have a few viola students at Reed College, and between all of it I’m trying to write some music. It is great to be busy. I am happy to have a lot of work and to become part of the musical community here. I’ve heard some of your music and one of the things I’ve notice is that many of the pieces have a strong sense of rhythm. Bunch: Yes, some of my music has a strong rhythmic drive. Rhythm is all around us. We have pulsating music, industry… it’s just coursing through our veins. A lot of times I will find an inspiration for a new piece with rhythm rather than with a melody… but not all of the time. There are a couple of pieces on the program, “Drift” and “Slow Dance” that are lyrical and more abstract. They don’t have a driving pulse. Your music also seems to have a lot of tonality but there’s always some dissonance around the edges. Bunch: I’m normally grounded in some kind of tonality. What’s fun today is that composers don’t have to follow any set of rules about tonality. There are times when I’m in a very traditional tonal key center. Sometimes I draw from folk elements that sit on one harmony for several minutes. Other times, such as in “Drift” and places in “Paraphraseology” that are almost completely removed from tonality. I like to have the freedom to go off the rails a ways and then come back. I like to explore the entire spectrum of consonance and dissonance. For me, dissonance has more meaning when it is in the context of a tonal framework. My favorite moment in a piece of music – mine or others – is the tension created from dissonance. I recently heard John Luther Adams’ “Become Ocean,” which didn’t have a particular destination. Do you always try to take the listener on a journey? Bunch: I’m normally inspired by trying get from one place to another in a piece, and I haven’t tried to write something that wouldn’t do that. I do enjoy music that exists in place without any development, and I’ve performed that kind of music. I like John’s music and have a lot of respect for him. It takes a lot of courage to write music where listeners experience sounds with no development. Everything in the upcoming concert of my music is intended to take you from point A to point B. Your chamber music in the concert involves more instruments than just the usual strings. You’ve got drums, marimba, clarinet, and piano. Do you try to learn what these instruments can do before you write something for them? Bunch: I’ve always been curious about musical instruments. It has been hobby of mine to collect them. That’s an interest that I got from my father who has dozens of instruments in his home. With the music I’ve written, I’ve been really lucky to work closely with virtuoso performers on each of the instruments that are in my chamber works. For example, I wrote “Paraphraseology” for marimbist Makoto Nakura. He would show me what worked well and what didn’t. I love finding out this stuff, and I think that it helps that I’m an active, performing musician as well. There are things that you find out from playing in front of people. I’ll bet that your wife has offered a bit of advice about some of the works that you’ve written for piano. Bunch: She has been an enormous help. I’ve learned tons from her about writing for piano. Before I met her I had written very much solo piano music. Since then, I’ve written her a piano concerto and a book of performance etudes. Have you written much for voice? Bunch: I’ve written songs for baritone. I haven’t written much choral music, but I do have a choral part in my second symphony. Wow! I didn’t know that you had a first or a second symphony. What is the big thing on your horizon? Bunch: Well, I just turned 40, and the thing that I would love to do some day is to write an opera. Any special notes for concertgoers who will be attending the Fear No Music at the Alberta Rose? Bunch: I hope that people can just come and enjoy the music. No one has to do any homework in advance. I hope that my music can connect with the listeners. It’s a real honor these days to ask anyone for their attention. To get people to focus their attention on something more than their cell phones is not easy! We are incredibly fortunate that cellist Alban Gerhardt has performed with Carlos Kalmar and the Oregon Symphony several times over the last few years. 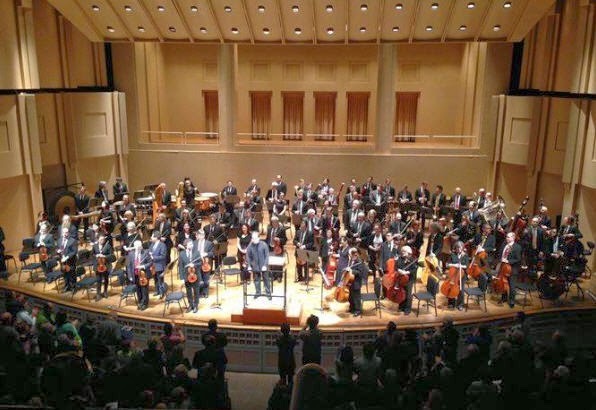 Their ongoing collaboration continues to strive for the highest levels of musicianship as was witnessed on Sunday, April 6th, when they performed Shostakovich’s Second Cello Concerto at the nearly sold-out Arlene Schnitzer Concert Hall. Because of its grumbling nature and tremendous technical demands, Shostakovich’s Second Cello Concerto almost 20 years have passed since it was last played by the Oregon Symphony (1995 with Lynn Harrell as the soloist and James DePreist on the podium). Fortunately, Gerhardt has the depth of talent, maturity, and insight to explore every facet of this gem. The main thread for the soloist sputters, mutters, and wanders all over the place, but Gerhardt knows how to make it all incredibly interesting with a gorgeous tone, pointed pizzicatos, insistent accents, agitated and unusual sliding passages, and brief lyrical encounters. Sometimes his playing took on elements of a soliloquy and at other times it is more of discussion or an argument with the orchestra. Gerhardt’s interpretation was a soul-searching one – with brief stretches that could be described as positive or hopeful – and it left an indelible impression of music that grappled with the somber consequences of life. The orchestra provided incisive accompaniment so that it was easy to hear Gerhardt (a not inconsiderable feat considering the acoustic of the Schntz). Associate principal Joseph Berger excelled with plaintive horn calls plus several wickedly high and fast riffs. The extended passages for cellos, basses, and French horns were outstanding. Also beguiling were the lines for xylophone and woodwinds and the segmented collaborations between the cellos, basses and Gerhardt. The program began with Arvo Pärt’s “Cantus in Memory of Benjamin Britten,” a seemingly simple piece dominated by slowly descending scales that are played at different tempos by various orchestral sections. Kalmar and the orchestra mined the depth of this music with great sensitivity and conviction, creating an atmosphere of somber anguish. Most impressively the orchestra increased the volume incredibly slowly to a loud forte and then decreased the volume incredibly slowly as well. All the way through the piece, a single chime would ring. The final scale-wise descent, ended up with the lower strings and finally just the bass violins. It was a very moving piece. After presenting two serious and sobering works, the orchestra finished the concert with a bubbling and lyric performance of Antonín Dvořák’s Fifth Symphony. Pleasant melodies the evoked cascading waterfalls and bucolic landscapes spilled out from all parts of the orchestra. The trumpets and trombones rifled fiery fanfares. Thematic material was deftly passed between sections of the orchestra, and often the cellos really shone with a big sound. Assistant principal Other highlights included assistant principal Graham Kingsbury’s post horn call in the first movement and principal Martin Hebert’s lovely oboe in the final movement. The big windup and glorious finale was a crowd-pleaser and the audience went home with a smile. But the main takeaway from this concert, for me, was the Shostakovich and Pärt. Both pieces are reflective on the state of humanity and should be heard more often. I recently sat down with Brandon Labadie at my home and talked about his new role as Executive Director of Portland early music collective Musica Maestrale. We also talked about the fascinating challenges of trying earn one's way in the modern music world using a centuries-old model. LW: I’m talking with Brandon Labadie, oboist and the new Executive Director of Musica Maestrale. How’s it going Brandon. BL: I’m well thank you. LW: So…new in town, eh? BL: Yeah I just moved here from New York, finished my Masters Degree in historical music performance… I play baroque oboe…and moved to the Portland area to do music and also build instruments with my boss who just moved to Wilsonville. We make historical oboes, clarinets, shawms and bagpipes. I met him in NYC and I’ve been working with him for a few years. He moved out here and that was kind of my big push to come out here. LW: I know that we were talking a little bit earlier about how interesting it is that the model that you seem to be following somewhat mirrors the way a baroque musician might have made his way [in the world] a few centuries past. BL: Yes, it’s very true I’ve been doing a little bit of everything: composing, playing baroque oboe, modern oboe, and I’m going to be playing shawm with Hideki [Ed Note: Hideki Yamaya, Musica Maestrale’s Artistic Director ] in July…and I’m building instruments. I think now for musicians it’s one of the only ways to be a musician—you have to become this person that does all these different things and you just have to make your way in a lot of different facets of music before you can start to focus on one of them…the one that pays, I guess. LW: [laughing] The one that pays…that’s always the rub. LW: So what led you to be a specialist in making and playing early wind instruments? That’s not exactly a common occupation these days. And that’s kind of when I started getting into this early music thing, and was playing in an early music ensemble, playing baroque style. So the next step after I had been immersed in these ensembles was to get an historical instrument. I ended up going out to Seattle to get a baroque oboe—there’s a maker just north of there—and I started teaching myself, and then I started to look at schools on the east coast for early music schools. There are two big ones –The Juilliard School and the Longy School of Music in Boston, and so I went and met the teachers and had lessons, did the auditions and was accepted into both. Juilliard was great because they have a new scholarship program for the historical thing they’re doing, so that obviously seemed like the best choice—to go do it for free. Because honestly it’s also—this thing was so new—it’s ‘are we going to have jobs when we walk out? Are there going to be gigs?’ And…just the exposure, and working with so many great musicians. You learn so many instruments; at Juilliard you learn the recorder if you’re playing oboe, and then you pick up shawm and things like that. So it’s just kind of cascaded into this—you start to learn all the early wind instruments almost, and its—like you were saying before, that a baroque musician played a ton of instruments, so they kind of perpetuate that at the Juilliard school. And so I walked out with a lot of knowledge and I felt good that I had made that decision. I felt that I had a lot of freedom that way, so now I can just do music and not have to worry about the orchestral auditions any more. LW: So in addition to crafting early wind instruments what are some of your other gigs around town? BL: I guess I barely touched on that. I’d been building instruments in New York, and when my boss moved out to Portland that was also kind of a reason to move out here. Outside of that I’ve also been playing modern oboe and I have a small modern group. We’re called the Silver Pocket, which was actually the name of Bach’s parent’s house, and I thought that was my cool early music “steal.” So we’re called the Silver Pocket and we play music for modern oboe, lever harp and interactive electronics. I do a lot of composing, and we play various gigs that we form ourselves. We’re going to Canada to play with some friends I know up there in their little venue. Other than that I was just doing concerts, and was featured on the audio guide at the Portland Art Museum for their Venice exhibit. They’re putting on this big Venice early music/art exhibit. I’m on three of the pieces; I’m talking about them. So I kind of approached them about it initially; I asked ‘can we put on a concert for your exhibit’ and it turned into: ‘can you come talk about the music you’re about to play for us, and can you come talk about these paintings of street musicians,’ so this chain of events happened there. Then my boss who builds the instruments and myself are featured in their Object Stories exhibit, about building new baroque instruments. Also my compositions which feature some baroque idioms but in a modern sort of way—that’s being featured there. So I’ve just been expanding in all these different parts of Portland as much as possible. I’m always looking for new places. LW: You also play with the Portland Baroque Orchestra? BL: Yes; there’s not a core group of wind instrumentalists, so I’ve been contracted to play with them twice, and hopefully again in the future. We did the Messiah, during the snowstorm, and we did the classical concerti, which is a very fun experience. So we performed on classical instruments there, which is an entirely different oboe, and the pitch is different and everything changes. That means more reeds that I had to make. LW: I’ve heard that making reeds is every reed-instrument player’s favorite task. BL: Yes, I think I make reeds for four or five different types of oboes. I just have boxes. And when you’re not playing gigs you make reeds for when the gigs come around. LW: Making reeds in your sleep? BL: Exactly. Nightmares about making reeds. LW: So you’re the new Executive Director for Musica Maestrale? BL: I met Hideki Yamaya, who is the Artistic Director, in December, and we immediately became fast friends and got along really well. We had the same vision for early music,so it was kind of an obvious pairing for us to just work together and put on concerts and organize this whole thing. We have some really cool ideas in the works for next season. Nothing’s official yet, but we’re looking to do Bach’s Coffee Cantata, and we’re going to do it in one or two coffee shops in Portland. I also have this very cool---I don’t want to divulge too much information, but we’re going to premiere—definitely in this state—a set of American baroque pieces that I found. And there’s going to be a pre-concert lecture about colonial music. It’s from the year Bach died actually. So it’s what people in America were doing in the baroque when baroque music was transitioning to classical. Kind of when Bach ended his reign, if you will. We’re going to be doing some music from America. American baroque, which is always fun. LW: Do you think the compositions that you’re looking at—and this is just my own hypothesis—are they a bit anachronistic according to what was going on in Europe? Let’s say they [Europeans] were transitioning towards the galante then. Was this American baroque a bit farther back in time compositionally or stylistically—or was it kind of on par with what was going on in Europe at the time? BL: What I will say about this is that—if you look at around 1727 or so, you start looking at [Domenico] Scarlatti’s pieces—there are a lot of them that are already in the galante style, what we would call it, already moving away from the baroque. Bach beat the baroque idiom into the ground; he composed in a very encyclopedic format. “How many hymns can I write before it becomes too much, or fugues, etc. etc.” So I will say, with that in mind, I think that the music I’m looking at is very—how do I say this—it does have an older style to it. Because today I can go in the internet to Youtube and hear what’s going on in the world super fast...it’s just amazing. But back then—with America in turmoil and this trying to break away—it wasn’t even 1776 yet. So there is a lot of stuff going on, definitely older styles. What the Brits at the time were bringing over kind of became what American baroque was, and became what colonial music was at the time. So yeah it’s definitely older, a little folksier; there are major voice leading problems in the music, probably some terrible chords but we’re totally going to own it. BL: They were a club. This music is from colonial Annapolis, and they had a club that would meet once a week and they would write these compositions and play them, and they had lists of the instruments they had in the club and who played what, and it’s kind of open-ended as to which instruments should play the pieces. And that’s kind of cool, because whoever showed up played the music. So we’re looking to provide a concert that’s sort of in the same format. And I think it’s definitely something that hasn’t been done over here; we’re excited about that. LW: Excellent; that sounds really fascinating. I’m looking forward to that now. I didn’t know that was in the offing; you learn something new every day. BL: Portland Baroque Orchestra is great because it offers this huge orchestral experience of baroque instruments. [For MM] it’s: ‘What can we do that’s as good[as]…and entirely different [from PBO].’ And I think that’s what we’re becoming…the answer to [someone asking]: “When PBO isn’t playing, what are we doing?” It’s hard for them [PBO] to do chamber music because they have this huge orchestra, so why [shouldn’t they] do orchestral works? LW: It seems to me like a lot of the essence of baroque music, for me anyway, is the small ensemble, it’s the two , five, six players, because, as anyone who knows about baroque music knows, for the most part [back in those days] they couldn’t field an orchestra as grandiose as the PBO…that might have been a large court orchestra—yet still they were making music everywhere else. And that’s why there are so many incredible pieces of music for these small ensembles. One of the wonders of baroque music to me has always been the wide variety of instruments. It’s almost bewildering…even people that study it for a long time…you know ‘I’ve never heard a chalumeau…what the heck is that? Or a trumpet marine, or…’ there were so many combinations. And part of that might have had to do with, as you said, whoever showed up had to play. BL: Yeah they’re amazing. But we want to provide the same experience with obscure works that no one has ever heard of. Like this American Baroque thing, or playing tiny Italian composers’ music, these people who wrote a handful of works and…Hideki and I spend a lot of time digging up new things and looking for new works to perform. And I think that’s an important thing that Portland can bring to the early music scene as well, because a lot of big groups have a hard time doing that music, and I think that MM…that’s what were headed for. Those horizons. LW: I guess I have another question specifically for an oboist looking at small ensembles. Can you tell us anything about the repertoire for something that MM might be able to realize with an oboist? BL: Fortunately for the oboist, most of our repertoire comes from the baroque. There are over ten thousand pieces just from the baroque era alone that are explicitly written for oboe, so it’s really easy to find works with oboe featured. One thing I will say though is we really take to heart the idea of house music, or making music with whatever instruments are lying around. MM just played at the Portland Art Museum for the Venice exhibit, and I played violin lines for pieces[on my oboe] because we had an oboe, and one violin. It was [written] for two violins, but we just said ‘well it’s two treble instruments, so we’ll make it work.’ Exactly what they [early musicians] would’ve done. Because sometimes you don’t have the luxury of being so picky. So it’s kind of cool—it’s a historical touch. LW: It’s interesting, as we were discussing about having come full circle—making your living much the same way that a baroque musician might have done. It’s fun to talk about that and I personally am pretty excited about MM and what’s coming down the turnpike. So thanks a lot for taking the time Brandon. 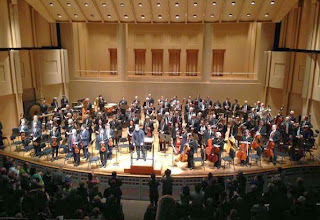 Wave-action was the dominant impression that the Seattle Symphony left in its wake after it performance in Portland last Sunday (March 30th) at the Arlene Schnitzer Concert Hall. The 87-member ensemble, led by its music director Ludovic Morlot, programmed two water-themed pieces, John Luther Adams’ “Become Ocean” and Claude Debussy’s “La mer” (“The Sea”), plus Edgard Varèse’s “Déserts.” In a way, the concert served as a tune up for the Seattle Symphony’s appearance in the Spring for Music festival at Carnegie Hall in May. The orchestra’s performance at the Schnitz was the first-ever in its 111 year history, and it was greeted with a nearly sold-out house in Portland. That good to see, especially in light of the fact that the Oregon Symphony’s debut performance in Seattle last year just barely seemed to fill a bit more than half of the seats in Benaroya Hall. It was interesting to note that Morlot didn’t use the podium that Kalmar and most guest conductors use at the Schnitz. Instead, it looked like orchestra brought a higher podium with two steps. The orchestra didn’t use risers for the back row (as the Oregon Symphony does), and perhaps that didn’t make much of a difference, because the brass and the horns sounded excellent in all of the works on the program. The performance opened with “Become Ocean,” which the Seattle Symphony commissioned from Adams and premiered in June of 2013. The orchestra was separated into three ensembles with two percussion batteries on the right and left, a pair of harps on right and left, and a piano right in the middle in front of the conductor. On a special note, Oregon Symphony violinist Emily Cole, whose mother, Linda Cole, is a member of Seattle’s violin section, played in this performance. As the program notes pointed out, “Become Ocean” didn’t have clearly defined episodes or a narrative of any sort whatsoever. Its music more or less put listeners right in the middle of swelling oceanic waves. Chords of notes slowly surged and subsided. Once in a while, a whale or some other large entity – emoted through a deep bass blur from the lower brass and strings – swam by. Sounds seemed to emerge from afar and from nearby, and sometimes the woodwinds created a sound that was like a choir of harmonicas. Overall, “Become Ocean” was like an hour-long, hypnotic, low pressure system and – perhaps owing to the afternoon timeslot – it sort of lulled the audience asleep. 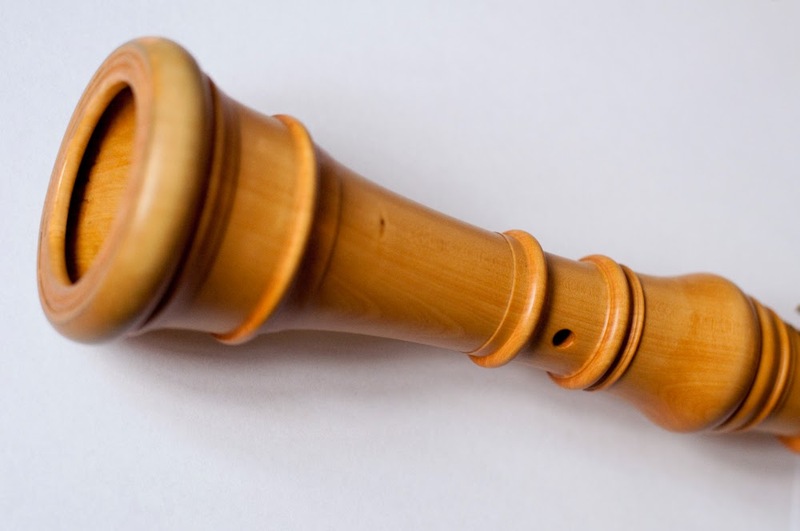 It is probably not the best piece to play while driving long distances, but it could be helpful for yoga. After intermission, the orchestra’s brass, woodwinds, percussion sections and the pianist reassembled along the wall at the back of the stage to perform Varèse percussive experiment “Déserts.” The style was pointillist yet conversational in that sounds were passed, at times, from musician to musician. There were a number of pinpoint exchanges but the fragmented nature of the piece left me with a feeling of bleakness that bordered on desolation and emptiness. The sounds did affect the audience, because coughing and the rustling of programs erupted from all corners of the hall and competed with the sporadic sounds from the instrumentalists. Varèse wrote the piece to be played either with or without an accompanying electronic tape. I am not sure that the electronic tape would have made all that much difference, but the mood in the hall was fairly charged up for something less dissonant. Debussy’s “La mer” provided the perfect tonic for the audience, and the size of the orchestra (with its full-sized string sections) gave the music the requisite heft, which made the finale very splashy. However, the first violins bobbled a couple of entries with their exposed high notes in the first movement and sounded a bit wheezy in the last movement when they had to sustain an extremely high note for a long time. The cello section was stellar throughout this piece, especially when they created glorious, golden-hued tones in the first movement and when they combined with the violas evoke tension and suspense in the third. Concertmaster Alexander Velinzon also excelled with his brief solo and the dual harps in the second were terrific. Morlot was a force on the podium and paced the piece very well so that the last crashing of waves were satisfying. The concertgoers stood up and responded to the performance with hearty applause, but I got a sense that they wanted a bit more music to wash into their ears. It will be interesting to find out how the orchestra does in New York. Alex Ross is a big fan of John Luther Adams music. So, that is a plus, but “La mer” will have to crest at the highest levels for the orchestra to make a big impression. Hopefully, that will happen. A very full house at the Schnitz greeted the Oregon Symphony for its concert of works by Messiaen, Chopin, and Brahms on Saturday, March 22nd. Most folks perhaps were there to hear Chopin’s Second Piano, which featured soloist Bertrand Chamayou. Others were certainly drawn by the Brahms Fourth Symphony. A few undoubtedly were intrigued to hear the orchestra’s first performances of Messiaen’s “The Forgotten Offerings” (“Les Offrandes oubliées”) .All of the pieces were conducted by Jean-Marie Zeitouni, who is the music director of the Columbus Symphony and the artistic director of I Musici de Montréal. 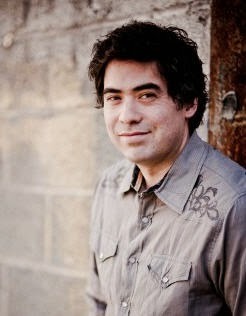 Zeitouni made his US-orchestra debut with the Oregon Symphony in the spring of 2005. Chamayou, a 33-year-old French pianist who has garnered much international acclaim especially for his performances of music by Franz Liszt, gave a pristine interpretation of the Chopin. It sounded lovely yet dull because he kept the volume between mezzo piano and mezzo forte. He never ventured a forte and if there were a piano concerto in need of a forte, this is the one. I thought that perhaps he would raise the volume of at least one phrase in the final movement, but alas, that didn’t happen. So the music, as beautiful as it was, didn't go anywhere. To their credit, Zeitouni and the orchestra played extra lightly so that the audience could hear Chamayoud. But while the result was unsatisfying to my ears, the majority of listeners loved the performance and awarded Chamayou with thunderous applause. He responded with his arrangement of a piece by Schubert. He played it brilliantly and at one volume – mezzo-piano. Messiaen’s “The Forgotten Offerings” was a real gem of a piece, and the orchestra excelled in creating the three Christian-inspired movements. The first one, “The CROSS,” sounded like someone (Jesus) walking purposefully through a haze toward a goal. The second, “SIN,” was announced by a percussive crash and an outbreak of business on all sides of the orchestra, and it culminated in a sudden crescendo. In the third, “THE EURCHARIST,” the cellos and basses reestablish a somber mood, which was followed by a pause and then came sublime lines from the violins that were refined by the violas and the piece ended on high notes that faded away. After intermission, the orchestra gave a very strong and emotive performance of Brahms’ Fourth Symphony. The strings played exceptionally well throughout. The woodwinds and horns gave a polished delivery. The brass topped it all off with an outstanding sound. Extra kudos for exceptional solos go to principal clarinet Yoshinori Nakao, principal horn John Cox, principal flute Jessica Sindell, and the trombone choir led by principal Aaron LaVere. The drives to climactic passages were thrilling and the finale was satisfying. A larger number of strings may have helped to elevate the dynamic range of the piece to a higher level. Zeitouni is just 40 years old, which is still young in the conducting trade. He is a large barrel-chested man but very agile on the podium, and concertmaster Sarah Kwak gave him a compliment by not getting right out of her chair when asked at the end of the piece to stand (which signals the rest of the orchestra). That gesture gave Zeitouni the heft of the applause.